I am a gardener, from a long line of gardeners. I can't claim to be the best at it, but digging in the dirt has been a source of enjoyment and satisfaction for me for much of my life. Over the years I've tried to lovingly instill a passion for gardening within my own children (the planting of 'seeds', both literal and figurative), as my parents did with me . 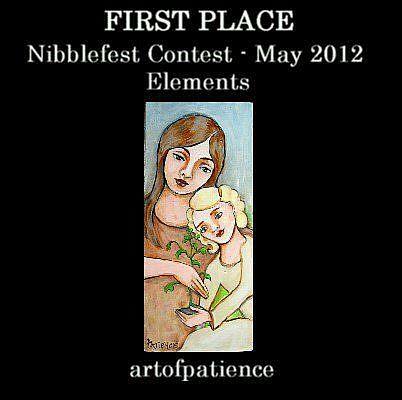 Time will tell to see if it actually 'sticks', but I'm hopeful...."
The third of four Nibblefest Art Contest entries, the theme for May being 'The Elements: Fire, Water, Earth and Air"
This is a painting entitled, "Faith in a Seed", and my entry for "Earth". ".....One of four entries by me for this month's Nibblefest Art Contest (NFAC) (~the theme for May being "The Elements: Fire, Water, Earth and Air") is an original acrylic painting of vellum, mounted permanently onto a 3.5" by 8" reclaimed wooden board (3/4 " thick). May's Nibblefest theme, 'The Elements', was quite different than usual. Being as that there are four classical elements (Fire, Water, Earth, Air), we were allowed to enter a total of four pieces rather than the usual limit of three, provided that each pertained to a separate element. This is my entry for 'Earth'.